HistoricRentals.com » Blog Archive » >You home and your hospitality were wonderful! « >Your chateau is trully something to behold! >You home and your hospitality were wonderful! You home and your hospitality were wonderful. I have referred your rentals to several people. Some are interested in the Paris apartments, and some interested in the cooking classes given at the chateau. 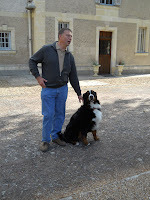 I am including a picture of Jean-Pierre and “Charlie” that I took on the day we left. Thank you again, and I hope to return or, maybe visit one of your other properties. This entry was posted on Wednesday, May 25th, 2011 at 3:33 pm and is filed under Château des Sablons, France, Harvest Suite, Loire Valley: Bourgueil . You can follow any responses to this entry through the RSS 2.0 feed. You can leave a response, or trackback from your own site.